1 lb marshmallows WinCo, Hy-Top, Aldi and Campfire brands work best. 1.25 lbs Wilton fondant Satin Ice fondant will also work. 2 tbsp warm water For dark colors, use 1 tbsp water, 1 tbsp food color gel. 1/2 cup vegetable shortening Also called white vegetable fat, trex, copha. Sift powdered sugar and set aside. Place your shortening in the stand mixer bowl. Melt marshmallows for 40 seconds in microwave (or on stove top) and stir with spoon. Melt marshmallows again for 30 seconds in microwave (or on stove top) and stir with spoon. Melt marshmallows for the last time for 30 seconds in microwave (or on stove top). Add water to bowl of marshmallows to detach them from the edges of the bowl and pour marshmallows into stand mixer bowl with dough hook attachment. Begin mixing. Add in half of your powdered sugar and let mix for 2 minutes. Take the soft mixture out of the bowl and put it into the bowl with the rest of the powdered sugar. Warm the Wilton fondant in the microwave for 40 seconds and add to bowl with powered sugar and marshmallow mix. Knead until powdered sugar, marshmallows, and Wilton fondant is mostly incorporated. You may not use all of the powdered sugar depending on your climate and that is ok. Pull fondant like taffy until it is stretchy and smooth. Store in a zip-lock bag for months at room temperature. Re-heat and knead well until stretchy before each use. You can add color as desired but for dark colors, you should add them during the mixing process or you could get a sticky mess. 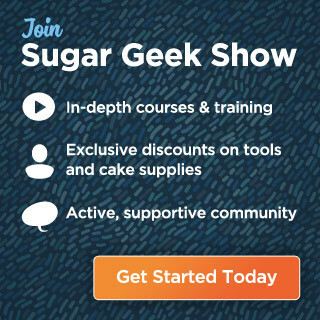 Updated version of LMF fondant is now available on Sugar Geek Show. One of the first things I focused on as a cake decorator is my fondant skills. I knew from the very beginning that I wanted to specialize in fondant cakes but the fondant I was using at the time (Wilton) was NOT cutting it for me. Now I know plenty of cake decorators that use Wilton fondant exclusively and works great for them. The cost to make 4.25 lbs of LMF fondant costs you about $5. Considering 5 lbs of wilton fondant costs you at least $20 and is considered the cheap stuff, I would say it’s quite the deal. I unfortunately, am not one of them. I find the taste to be, well, tasteless. The fondant hardens to the point that you would sooner peel it off your cake than consider eating it. To me, this is a problem. I wanted my cakes to be as delicious as they are beautiful and I could not achieve that with store-bought fondant. I began experimenting with various homemade fondant recipes of varying degree. None really turned out the way I wanted them to be (or how I thought they should be) but I eventually came upon a fairly easy recipe that I thought tasted amazing. The only problem was it tended to tear easier than I wanted and was a bit too soft. At the time, I was desperate for fondant and had no time to run to the store so I added what I now call my secret ingredient. The fondant worked so well I have never bothered searching for another recipe. Happy accidents are amazing aren’t they? The cost to make 4.25 lbs of LMF fondant costs you about $5. Considering 5 lbs of wilton fondant costs you at least $20 and is considered the cheap stuff, I would say it’s quite the deal. Another plus side to this fondant is it is extremely flexible so you can roll it out very thin. Not only does it meld perfectly with the buttercream but it stays nice and soft so you barely realize it is there. I usually heat my fondant up before working with it and it actually makes it perform better! 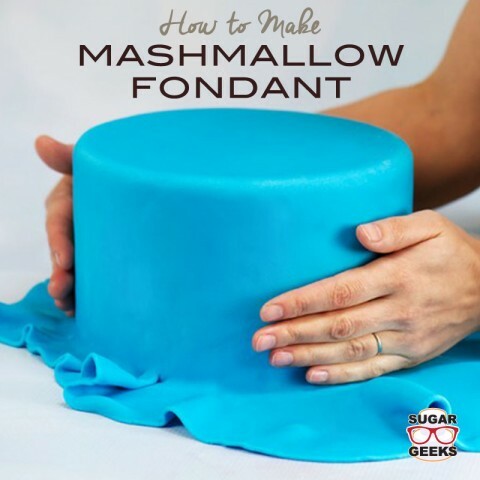 I hope this marshmallow fondant recipe changes your mind about what fondant has to taste like. Rating: 5 stars, reviewed Jan 1, 2011. Rating: 5 stars, reviewed Feb 8, 2011. Rating: 5 stars, reviewed Oct 15, 2012. Rating: 5 stars, reviewed Nov 29, 2010. Trying my first batch and need it to be close to Navy blue. I chose Wilton blue vanilla fondant to help get me to the dark color quicker. I plan to add more color to the melted marshmallows. Black and violet to get to my color. Any tips on how much color I may need or what you would do Liz? I would suggest following the black fondant tutorial. Using the dark blue wilton is going to really affect the final texture. To get Navy blue you just use 1 Tbsp of royal blue food coloring and a drop or two of black. Hi I really enjoyed your youtube and have 2 questions for you. 2) what quantity of tylo would i use to fondant when wanting to mark figures? 3) I am making a princess cake for my grandaughter’s birthday will this fondant need to have tylo so that the skirt is beautiful and flowing – what do you suggest? How do you store the excess fondant? Or do you just throw it out? Hi just tried this using haribo mini marshmallows trex and silver spoon icing sugar. It came smooth but when I pulled on it, it did not stretch. In fact it was still sticking to my hand as I tried to knead it like you said by stretching it like taffy. My fondant is not looking as white as the white Wilton I bought to mix with it. Could do tell what I did wrong? Is there a way to make ombré colored fondant without making 3 batches? Thanks! Can this be made into chocolate? Can you do this without a stand mixer? Hello Liz. Thank you for sharing your knowledge with us so readily. Can you tell us, is this fondant appropriate to use for parts of a cake that sits away from the main cake. Hi Liz, I have a question about this fondant, I’ve made it a few times now, and love the taste, my issue is that it always comrs out very soft, to the point, I don’t have to heat it up, I was wondering if it’s because of the humidity here. Can you give me an idea how to get it alittle firmer? It’s alittle hard to get it on the cake, without it tearing. Thanks for any imputed on this. After covering a cake in this fondant, does it need to be refrigerated? Tried this recipe today it came out perfect!! I love your tutorials! I made this two nights ago and covered a cake with it last night. When I first saw this recipe I felt it was too complicated and more ingredients than I would want to make fondant with. I decided to give it a try because I have had not so great luck with other brands and the fondant tearing while applying it to the cake. This is from now on my go to fondant!!! The recipe (although messy lol) was super easy to make and I did have the recipe and had more than enough to cover a 6 inch cake and have some to cover another cake and to make some toppers. I love the stretch factor and there was no tearing on my cake. Amazing recipe and now that I have tried it, cheaper than traveling outside my area or paying online for the bigger name brands. Thanks so much for this recipe. for veg. shortening can I use crisco? and for the marshmallows can I use Jet? Hey Elizabeth! I am going to make your fondant and wondering if I will have enough for the size of my cake. It will be 12″ wide x 18″ Long x 5″ high (it’s going to be a coffin cake for my dad’s 60th). Will this be enough or will I need to make a bit more or double it? So no need to double the recipe? just making sure that is right! Elizabeth, Everything turned out great and I you’re right I had enough!! Love the taste! I am making a cake for my son and I know I will have a lot left over, how many months can it be stored for? Also, if stored in the fridge or freezer would that make it last longer? Hi Liz I love your MMF recipe. I watched your cake box tutorial. You say that the cake is chilled. Do you refrigerate fondant covered cake? I was told not refrigerate fondant covered cake. Maybe you can clear up this mystery. Short answer, yes you can chill fondant cakes. They will sweat a little when they come out of the fridge and that is normal but it does not harm the cake unless you are in an extremely hot/humid area and your cake is very very cold. My refrigerator is set to the warmest cold setting (if 8 is coldest and 1 is warmest it’s set to 1) so that it’s chilled enough to firm up the butter in the buttercream but it doesn’t take much for the cake to come to room temp. You can also put a fan on the cake when it comes out to help the sweating. I hope that clears things up! I actually just came across this recipe, and I am SO eager to try it. I actually want to try it tonight! That being said, I just started making cakes about a month or two ago, and I use a hand mixer at the moment, do I HAVE to use the dough hook attachment? Because I don’t own a stand alone mixer yet. Crazy question, I know! I used your black lmf recipe and it came out horrible, tried twice. I hear great reviews, what am I doing wrong? Any tips, please!!! I live in hot, humid Houston. My fondant was tearing and porous looking. Please help! I need a black cake. Hello, I just made the fondant and it is perfect and taste good. I rolled it and again it is perfect. Thanks for sharing. I am very impressed!!!!! If I need more color into your batch, will more liquid (color gel) change or ruin the consistency of the fondant? And thus make it too sticky? I too as many other commenters have tried out too many fondant recipes, that I actually avoided fondant for a while. But I’m making my brothers graduation cake and will make a 3 tier superhero cake in one month. So I was searching up a great recipe, and I came across yours! I already like the sound of it, and I haven’t tried making it yet. And even more, the fact that you posted the whole video, and not just 4 minutes. Please use the colored fondant recipe (black or red) and adjust the color to your liking. Thank you so much!! I am looking forward to using your recipe! How much cake can this 4.25 lbs of fondant cover? Liz, do you use cornstarch versus powdered sugar when rolling it out? Hi Liz, I’ve tried your recipe with the buttercream before (it was fabulous, just fyi). I was wondering if I can use this same fondant to cover ganache frosted cake (instead of buttercream). Thank you! I felt like i overmixed because it became a crumbly ball, no longer goopy and smooth like yours. Do you think I added too much sugar during the mixing process?? How long do you pull like taffy? 10 minutes? And thank you for the response! My partner bought the Campfire marshmallows but bought the EXTRA LARGE ones! It was too late to buy the mini ones so I had to cut those suckers up using a pair of kitchen shears dusted with powdered sugar. Then my friend BROKE my tamis so I had to use a small sifter to sift 2 POUNDS of powdered sugar!! However, once I got everyone OUT of the kitchen, the recipe worked beautifully! Note to self: never let kitchen newbies help you in the kitchen! Have you tried this recipe without the Crisco? I do not use hydrogenated fats in any of my pastries. Just an FYI Lizzo, I used butter instead of shortening and it turned out great. I took it to a wedding tasting for which I was suggesting the design be created using fondant for a crip and clean look and the they said they hated fondant and would not consider it but after tasting the LMF she agreed to the fondant and was surprised it was so good. Thank you for sharing your recipe with us, I also love your book! I had a request to cover a chocolate cake with white fondant. Have you used this fondant over a chocolate cake with chocolate buttercream before and had success with no show through? I always get a little show through with chocolate buttercream so I usually let the client know that the outside of the cake will have white buttercream but the inside will be chocolate and let them know why. They are always understanding. You can make them as far in advance as you want. A week is probably good but you can do earlier if you need to. Thank you! Should I keep the figures out in open air or in a container?refrigerated or not? Open air, not refrigerated. Its like candy. hi liz, i just made this fondant. It did not turn out right and it tastes horrible.. I followed the recipie completely. It is very dry. Any suggestions? Hi, do you recommend to make this fondant the same day or days before ahead, also for the wilton fondand, you used half of it, how many grams of it?. Because the recipe calls for 1.25 Lb. of fondant, but the box that you are using looks like 5 Lb. box, and then you said to use half of it( 2.5), so I don’t get it, please tell me how much do I need. Half of one package inside a 5 lb box. There are two packages per box. Hi I am so ready to try this recipe however it will be my first time using fondant. I wanted to make it for a party for next week, I am wondering if it will still be good if I made it in advance and just kept it in the fridge until the day when I will apply it to the cake? Just trying to be good with time. My light blue fondant has a purple tint is there a why to make it more blue? Perfect recipe and have been using it exclusively for a couple of years. How would I adapt this for chocolate fondant? Is my marshmellow fondant supposed to be dry and smooth? When pulling my marshmellow fondant apart until it’s like taffy, what happens if it tears apart? Hi Liz, I made the LF fondant step by step and it turned out great the same day. I made it a week before my son’s bday party. I stored it an a ziploc bag and kept it at room temperature. It never got hard , but the day I wanted to use it it was not as elastic and pliable as the very first day. I kneaded it and tried to roll it and cover the cake but it was tearing and was crumbly. How long should I knead it for ? I did warm up the fondant in the microwave for 1 min and got a little softer but didn’t get the consistency I wanted. I wonder if I needed to use a lot of powder sugar at the time of rolling it , or maybe needed to add shortening, please advise. I have another cake to make in 2 weeks and would like to know what to do or what not to do. I refuse to buy pre made fondant, I am a big fan of you and would like to make it myself. The cake though; was delicious as usual…. made it orange flavor following your instructions. Hi, thanks for sharing this recipe, I would like to make this recipe but adding some color for a frozen themed cake any ideas what to use for coloring?, thanks. Is it okay to store my fondant covered cake overnight in the fridge? I seem to remember you commenting that it’s ok but I can’t seem to find that post again. hey love, i enjoy your video and gave me a lot of ideas i can use for a cake im doing but i need a bit of help with something. you say pour the food coloring while its mixing in the mixer but when you later on add the wilton fondant doesnt that dis color it or making it lighter. lets say if i want dark pink and when i put the fondant white wont it make it lighter or mess up the original color that was planned? Thank you for this recipe. I’m a beginner and have never successfully covered a cake without pleating or tearing. I persevered and tried again today using this recipe and SUCCESS!! I used Walmart Great Value brand mini marshmallows. Hi Neydi! I had a similar tearing and “mudslide” result when I attempted to cover an assembled cake frosted with a whipped cream/mascarpone/lemon curd frosting!! Wondered if it was a bad batch of fondant or if something in the frosting was melting/dissolving the fondant? I’m a novice baker who has now half dozen fondant covered cakes under my belt, and never had problems in the past. Anyone have good recipe for tasty crumb coat frosting that’s safe to use under fondant? It can be flavored any way you want. It works perfectly with fondant cakes. I need to make the fondant cherry red. Any suggestions for keeping it from turning pink instead? Thanks! Something called TREX I hear is the same thing. I have used the Wilton fondant so far and my kids and others don’t enjoy the taste. They just peal it off and eat the cake alone. Came across this video and tried for the first time. It came out extremely well. I used it to decorate a cake I made for my friend who is a doctor. It was a huge success and everybody ate the cake with the fondant. I want to thank you so much. Have included a picture of the cake I made using the LMF. Just wanted to ask you.. Want to cover a big size cake with black fondant… Will it be okay if I add the black Wilton icing color to the melted marshmallows before adding the powdered sugar ? Will it turn out well ? Please do reply. Thats great to hear! I have a recipe specifically on how to make the lmf fondant black under the recipes tab. Thank you Liz. Will try it out and let you know the result. What is wilton fondant? ?whr will v get it?? M from Oman n I donno whether I will get it hea! !what can i use instead of it??? Is the wilton fondant optional or really needed? I am planning to make a cake for my son’s third birthday party. This will be my first time ever with Fondant. I have been playing with play-doh to practice molding little trains Would you recommend I use this recipe or just work with Wilton fondant. Is LMF fondant easier to work with for a newbie? Wilton fondant is very expensive in Australia. Can we use Bakels? Can you use the Cake Boss fondant instead of the Wilton brand? I’m doing my first ever wedding cake this September and the bride wants chocolate cake. Will this fondant cover chocolate cake without it showing through the fondant. I have had this problem for awhile and am getting so frustrated that I thought I’d ask for help. I live in a humid environment (KS) and always have more trouble in warmer weather with my fondant. Lately it has been very porous and “crumbly” looking, for lack of a better word. I notice that it is more of a problem when it it humid and I also notice that adding color makes it worse as well. I have used your fondant recipe (liz marek) and use Americolor gel (as most of my batches are smaller I color after it has already been made. Hi Liz – I have this same issue with the last 3 batches I made. The first was coloured so i figured i added too much like you mentioned. Only thing is that the other 2 batches are plain white, no color added. Could it be the warmer temperature in our house now that its winter (im up in canada). I never had issues with LMF before and I’ve made tons of batches. Its frustrating because it tears as im trying to cover cakes. I’ve tried added more icing sugar and kneading but it never gets better.. I am having the same issue!!! I can’t figure out what I am doing wrong. If you figure it out, please share. Hello Andrea. Another thing I’ve tried that has been working for me is using a bit less powder sugar to your fondant. Just add the sugar until the fondant is no longer sticky, you won’t necessarily use the entire 2 pounds. Hope this helps! I am trying this for a third time tonight. I will try your tip! Thank you!! You don’t need to throw away the old fondant. Just re-heat and pull like taffy. I love this recipe and it is the only thing I use but I can’t get really white fondant. What do you do to get white white fondant? I always add some Americolor white into mixer or when you knead by hand. It helps make colors more true. LOVE THIS RECIPE. Never fail for me. I’m a hobby baker and just need a small batch for making a few decorations here and there. Can I half this recipe and still get great results? And if so, how much Wilton fondant would I use? Does this take color well after it’s been made? Did you grease your plastic bowl that you melted your marshmallows in? Thanks so much for your help. Can’t wait to try this recipe. Hi. I’m in the same boat. I need to only cover one 8″ 2 layer cake and that takes about 1.5 lbs of normal fondant. Did you try halving it? I got the 1.5 lb box of Wilton and will cut it in half and half everything else. I made normal MMF before with the exact same recipe except the shortening and Wilton. It worked OK but was sticky and harder to work with. Hoping this gives me the best of both worlds. Hi, i would like to know for how long this fondant would be good to use. . Thanks? Hi, Liz! I’m making my fiance a birthday cake and need to make fur. I’ll be using the walnut clay extruder. Have you used this with an extruder? Should I expect any complications? Thanks! Can you use butter instead of shortening? Thanks! I’m so glad I found your recipe! It will save me a lot of money! I have a quick question, the video shows you using 1/2 of a 5# box of fondant, but the written recipe says 1.25#’s. Is that the difference in using the old fondant in the video vs the newer fondant in the written recipe? Thank you, thank you, thank you! This was my first time working with fondant and I was so happy to find a way to make it taste good. I used it to cover a cake and to sculpt a topper. It came out beautifully. woow! That is beautiful!!! Did you make red fondant by adding red color to marshmallows or afterwards in the fondant? Love the recipe…it’s the only one I use! Can you tell me what you would add to make this a chocolate fondant? Thank you! If you add the fondant to the cake while fondant is still warm, will it retract any? Where do you get the Wilton fondant? you can purchase it at michaels, walmart, joanns, hobby lobby, and cake decorating stores. Okay I admit it was a bit skeptical, but OMG. This fondant is amaze craze, Thank you. Can I use a hand mixer instead of the big stand mixer? Also if I need just a small amount of fondant in a certain color, can I add color later on in the process? Love this! Thanks for sharing! Can’t wait to try. Curious, can I get the same results by hand mixing instead of using the dough mixer? I usually dont make comments etc, but i have to for this. This recipe and this video has been heaven sent! Thank you elizabeth marek for being so generous in sharing this amazing secret recipe. I have now made it twice, each time with absolutely no trouble whatsoever, the process for me was as smooth as ur video. Infact i actually make it at the same time as i watch it. What a difference this has made in my little cake business from home, in both taste of fondant, ease to work with, and of course the $$$ in savings. I hated and cringed when i knew i had a order that required fondant, praying and begging my lucky stars that the store bought fondant i bought would not cause any major problems. Absolutely love this and will NEVER try anything else again!! Loved your video. I have a question. I’m only trying to make 1 pound of the fondant. How would I convert all the measurements to that? I like this recipe, thanks. Please give me the recipe in grams? can you put glycerin in the marshmallow fondant recipe to make it more pliable? Would it be fine to use Satin Ice instead of Wilton? Can I use Satin Ice or does it need to be Wilton? I’ve made your LMF and LOVE it. Came out perfect the first time. Question about black… I watched the video….what would adding Wilton’s premade black instead of white do ? Nothing really, it’s not necessary to use. If you have it on hand you can use it but it just adds expense to the recipe. Hi Liz… First of all, I’d like to thank you as you have taught me so much. I’ve made pepperoni cake and modelling chocolate from your tutorials and now I’m going to try my hand at this. Here is my question, at the moment I don’t have a kitchen aid mixer. I have a Hamilton beach mixer but it does have the dough hook. Will that work okay or should I just try it by hand? Same question here. Should I just try it by hand? Liz, can you do a tutorial on Marshmallow Cocoa Fondant. PLEASE. I am new to you and just discovered you yesterday but your teaching is terrific. God Bless. Hi Liz. I am in Australia and we can get the Campfire brand marshmellows occassionally, only problem is we can only get regular size, not mini. I made a batch the other day but the marshmellows didnt seem to melt like yours did, rather they went stringy. I only made a half batch but the mixture seemed very dry from the beginning when adding the sugar to the mixture. Do u think it may be because of the larger marshmellows? When I tried to make this fondant it remained sticky and never got stretchy when I needed it, it kept cracking. Do you have any idea what I may have done wrong? Also if using this on cake dummies for display will it harden when dry? Hi, thanks for the quick response. I kneaded for more than 10 mins and it didn’t change. I did think that but continued to knead to no improvement. Do you know the ingredients in your marshmallow ? Or a brand I could get in the uk? Hi! Thank you for this recipe! I am using this for a third cake and love it!! So far has worked perfectly for a wedding cake, graduation cake and Sweet 16 cake. Everyone loves the taste also! Butter heavy whip and condesned milk. It usually will be soft What would your recommend for crumb frosting the cake so that fondant will be nice and smooth even at room temp when filling gets softer. How about the sweat issue when covering chilled cake? a little sweating does not hurt the cake coming out of a fridge. Work in a chilled room. If its very humid work with a fan on you. So you think when a chilled cake is being covered with fondant will no longer get soft and get bulges once cake comes to room temp? Do you have a recommendation for making grey fondant? I am making a pink and grey elephant themed cake for a baby shower and I wasn’t sure about making grey fondant. I have read a few things online but hesitant tontry with your recipe..please help! to make grey you just add a little black to the white. If it has a purple tint then add a bit of yellow to counteract it. If it has a green tint add a little red. Thank you so much! I am sorry I didn’t see your first reply. Which brand do have a preference for? Americolor or Wilton? I have both..I was also curious of you mixed some black and white coloring together first to make grey and then add it to the marshmallows would that work? Mixing black and white together and then adding it to white fondant is counter-productive. The fondant is already white so you only need to add the black. Thanks so much for your help! Do you like using Wilton gel or the Americolor? I have both..
How long do you usually chill your cakes with the buttercream covering before putting on your fondant? Can I refrigerate the completed cake over night with the fondant and transported the cake the next morning? Hi Elizabeth..I just made some fondant that is supposed to be a cornflower blue but it has a purple tint to it..is there another color I could add to make it more blue? Have you ever made grey fondant? I am making a pink and grey elephant themed cake for a baby shower..I am hoping for some good suggestions. I love using your recipe on my cakes! Grey either has a purple or a green tint. To make a true grey you need to counteract the tint. For green tint, add a tiny bit of red. For purple tint, add a tiny bit of yellow. Thanks! Hi Liz, THANK YOU SO VERY MUCH! I’ve just made the recipe, and WOW! I’m so happy with the result. I’m in South Africa, and since we do not get half the brands here, I was sure this was going to be one BIG mess. But luckily, not! It turned out great, and it tastes 150% better than any shop bought fondant. I do however have 2 questions… First- I have the elasticity, and it’s come together quite nicely, but it remains a bit sticky (tacky is a better description).. I don’t want to add much more powdered sugar, as I’m scared it will be too dry. Does it stay quite sticky normally?? Then- can I mix this type of fondant with Modelling chocolate? Will it work? Again, a THOUSAND THANK YOU’s! Love your work (btw)! if it’s a bit tacky, just work in a bit of shortening until it feels smooth. yes you can combine with modeling chocolate glad you enjoy it! I only recently discovered adding Modeling Chocolate to MMF and it it wonderful. I needed black and adding dark choc MC made the steps getting to black much easier. It also tastes amazing. Tomorrow I am using white MC. I tried to do a dark blue for fourth of July and it turned out to be royal blue color any suggestions? Hi love this recipe. Thanks. My question is I have air bubbles do u know why? I see in the vid that you’re using the OLD formula of Wilton ROLLED fondant. Does this recipe work with the new Wilton “decorator preferred”, as well? hi elizabeth could you please provide a link for the wilton fondant recipe? not sure which recipe you mean. Help I just attempted to make LMF. I followed your video step by step and mine never got smooth and soft in mixer. It seemed dry even after adding fondant. I tried kneading it and stretching but it looked dry and broke apart. Not elastic like yours. Thanks for the reply. I think you are awesome luv your work. How can I salvage if I added too much powdered sugar? Mine isn’t that stretchy and breaks apart. Hi mine came out super sticky is there anything I can do to salvage it lol thanks!! Do you have to use an electric mixer or is there another way of doing it? Do you find that you are able to make any decorations using this fondant, or do you use a different recipe or brand? Also, do you have any trouble attaching decorations to this fondant, such as having it sag under the weight if something is attached to the side of the cake? Thanks for the awesome tutorials and the recipe. I’m wondering this same thing…. I am hoping to use this fondant on a cake today, but I need to attach fondant diamond shapes to the outside of the cake, but I’m afraid they wont stick because the fondant is so soft. What do you think? Fondant sticks to fondant no problem with just a little water. If you want the diamonds to be easier to handle, add a little tylose powder or mix with a little gumpaste and cut them out and let dry a few hours before attaching to the cake. When I tried mine it looked great! However after rolling it out and lifting it, it kept stretching and falling all over the place. I got it on the cake but it would not hold any shape and stay together. What happened? Too much marshmallow?? Its hard to say since I am not there and didnt see you make the fondant. What marshmallows did you use, did you follow the directions exactly when mixing? Did you add all the sugar? How much water did you add? We can’t get bulk white marshmallows here in New Zealand so I wondered if it could be made with homemade marshmallow? If yes, would you have to let it set and then chop up or could you use it before it sets? I need urgent help plz! I tried my hand at marshmallow fondant 1st time today & disaster When I tried to melt the marshmallows (Campfire brand, pic attached) in microwave in 30 sec bursts, it slowly turned into a light brown & very sticky, stretchy mess (pic attached – after I added about 1/2 c icing sugar to the mess). The expiration date is ok.
You burned the marshmallows. Heat only until they are melted, maybe your microwave is hotter than mine. Curious to know if you have tried this without adding the wilton fondant and only the Crisco? If so how well did it or did not work. Thank you for the great video and recipe! Actually it does work, you just need to tweek the recipe a bit and use some corn syrup and nix the veg shortening and water.